Alas all 'crude' things in life come to an end, with King Salman replacing Ali Al-Naimi – Saudi Arabia’s oil minister who has been a regular feature at OPEC for over 20 years – with Khalid Al-Falih, chairman of state-owned oil giant Saudi Aramco. It seems Al-Naimi’s outing to OPEC in December 2015 was the eighty-year old industry veteran’s last. For over two decades as oil minister, and a professional career extending well beyond that, Al-Naimi witnessed the oil price soar to $147 per barrel and plummet as low as $2, and by his own admission everything that needed to be seen in the oil markets in his service to Riyadh. Every single OPEC minister’s summit the Oilholic has attended since 2006 has almost exclusively revolved around what Al-Naimi had to say, and with good reason. For the mere utterance of a quip or two from the man, given the Saudi spare capacity, was enough to move global oil markets. Since 2014, he doggedly defended the Saudi policy of maintaining oil production for the sake of holding on to the Kingdom’s market share in face of crude oversupply. 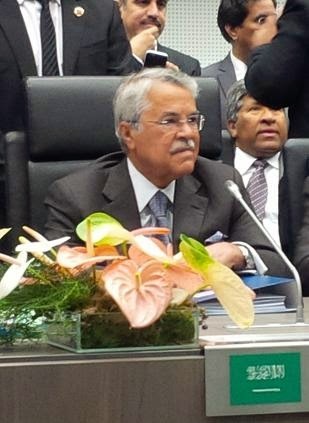 Both under, King Fahd and King Abdullah, Al-Naimi near single-handedly conjured up the Saudi oil policy stance. But King Salman has gone down a different route. The new oil minister Al-Falih will undoubtedly draw the biggest crowd of journalists yet again at OPEC given the Saudi clout in this crude world. However, Al-Naimi leaves behind some big running shoes to fill, and perhaps his predecessor’s signature pre-OPEC power walk (or was it a jog) on Vienna’s ring road with half of the world’s energy journalists in tow chasing him around the Austrian capital! For the Oilholic it has been an absolute joy interacting with Al-Naimi at OPEC. Somehow things will never be the same again at future oil ministers' meetings, and that’s just for the scribes to begin with. That’s all for the moment folks! Keep reading, keep it crude! © Gaurav Sharma 2016. File photo: Ali Al-Naimi, former oil minister of Saudi Arabia © Gaurav Sharma.